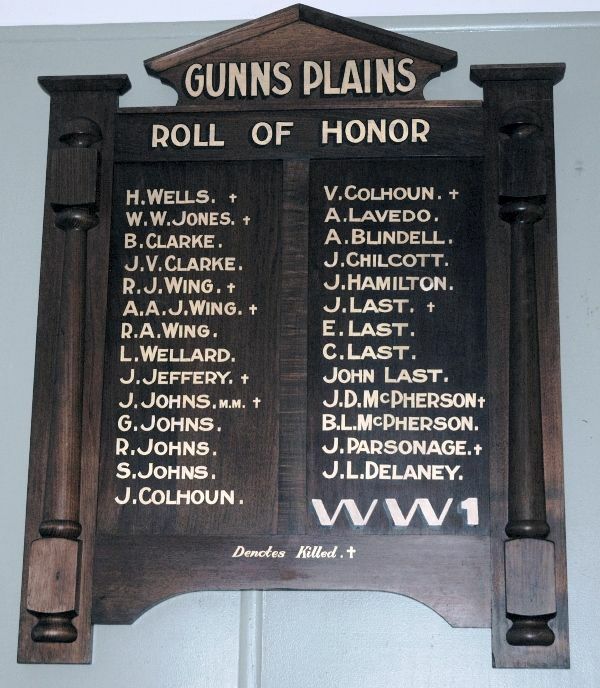 A wooden honour roll which commemorates those who served in World War One. In spite of the inclement weather, a crowded congregation witnessed the unveiling of the honor roll of those who went to the war from the Gunn's Plains district. The rector, with the Warden (Cr. H. A. Nichols) and Mr. E. J. S. Delaney, took part in the proceedings. Mr. Delaney conducted the prayers. After the lesson the honor roll was unveiled by Mrs. Johns, sen. The names of the 17 men were then read by Mr. Delaney, and one minute's silence being observed while the names of those who fell were remembered. Advocate (Burnie), 16th September 1930.